Today Jobfeed published the Q2-2014 Jobfeed index on the Dutch online job market This index is based on the analysis of more than 1,5 million job postings (316,000 unique jobs after deduplication) published in the second quarter of 2014 in the Netherlands and collected by Jobfeed. Jobfeed is the labour market analytics tool of Textkernel that collects and categorizes all online jobs in the Netherlands and makes them searchable. According to Jobfeed, the number of jobs (excluding internships and volunteer work) in Q2 2014 has increased by 17% compared to Q2 in 2013. While this is a large increase, it is still below 2011 figures. The chart below shows the number of all* jobs per quarter between 2010 and 2014. Since the second half of 2013 an upward trend can be observed which indicates that the labour market seems to be picking up. ICT and Sales combined (the two largest profession classes out of 26 in total), represent more than a quarter of all online jobs in the Netherlands. The share of ICT jobs, which increased more than 3.2% between 2012 and 2013, dropped by 0.6% between 2013 and 2014. 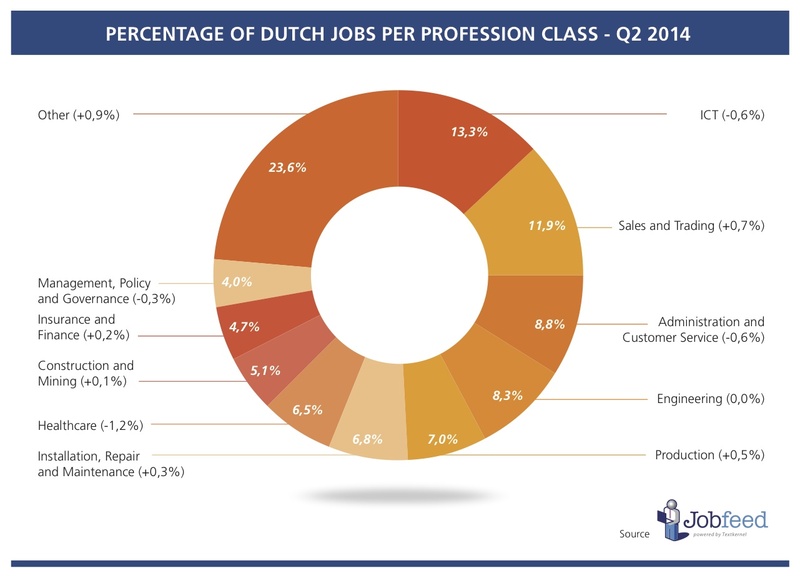 With over thirteen percent of all jobs, ICT remains the top profession class in the Netherlands. Sales & Trading and Production are showing the highest growth over a year with respectively 0.5% and 0.7% over a year. Healthcare jobs have become an increasingly smaller part of the Dutch online job market. In the the past 2 year these professions saw their market share shrink by 1.6% in 2013 and 1.2% in 2014. As a result, Healthcare dropped from the fourth largest profession class to the seventh. Utrecht no longer has the fourth position of provinces with most jobs. Utrecht’s market share shrank by 0.1% and was surpassed by Gelderland which grew by 0.3% in market share. 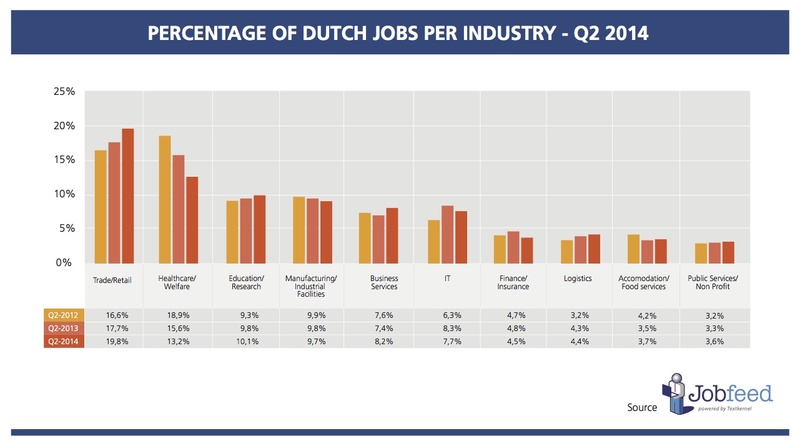 10.4% of all online jobs in the Netherlands posted in Q2 this year were for positions based in Gelderland. 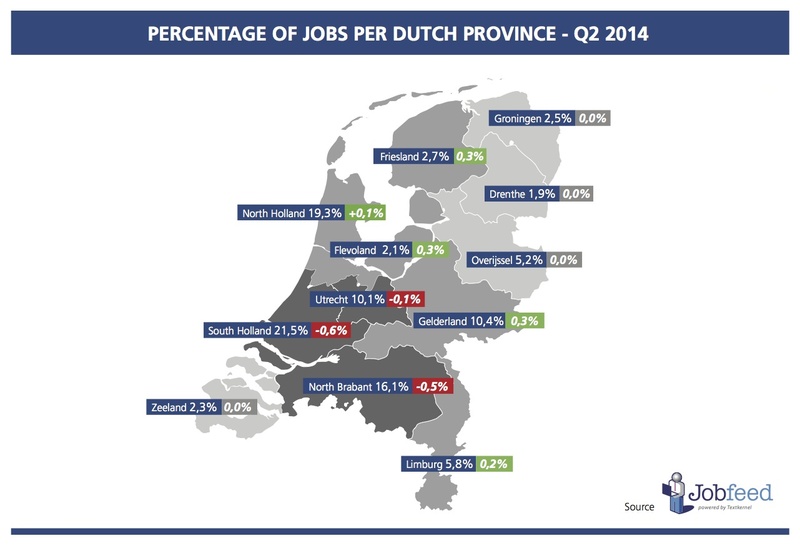 South Holland experienced a decline of 0.6% but kept its place at the main employment area in the Netherlands. Friesland and Flevoland both gained market share of 0.3%, while Noord-Brabant saw its share shrink (-0.5%). Trade and Retail, the main sector of employment in the Netherlands has gained even more ground since 2013. Figures for Q2 2014 show that the sector gained more than 2% share in the span of a year. The second biggest employer in the Netherlands, the Healthcare sector, has however experienced a steady decrease since 2012. Losing 2.4% compared to last year, and over 5,7% since the second quarter of 2012. Business services have gained 0.85% over last year in the same quarter. Download the complete Q2-2014 Jobfeed index on the Dutch online job market. This index is also available for the German and French market. Numbers come from Jobfeed, the labour market analysis tool of Textkernel, that collects and categorises all online jobs and makes them searchable. Each quarter, Jobfeed will provide the latest statistics on the online job market. For this analysis 1.5 million Dutch job ads, posted between 1 april and 30 June 2014 have been analysed, categorised and deduplicated. 316.000 unique jobs, excluding internships, summer/temp jobs, volunteer work and franchises, remained and are the source on which these analyses have been performed. * for the comparison of unique jobs between 2010 and 2014, all jobs (including internships, summer/temp jobs, volunteer work and franchises) have been used, since Jobfeed only started to distinguish between these contract types in July 2011. In 2003, Textkernel started aggregating job vacancy information for matching and analytical purposes under the label ‘Jobfeed’ in the Netherlands. Today, Textkernel is market leader in this domain in the Netherlands and since 2012, has been expanding Jobfeed into other countries in Europe, such as Germany and France. Jobfeed searches the Internet daily for new jobs via an automated process and determines with machine learning technology whether a page is a job vacancy or not. Found jobs are automatically cleaned, extracted, categorised, enriched, deduplicated and recorded in the Jobfeed database. Due to its strong technological base and domain knowledge, Jobfeed has become a unique source of job market data, allowing users to gain insight into the demand side of the labour market. The information provided in this article and in the related Jobfeed index is classified as public. Its use is permitted in public communications if the source for the information (Jobfeed) has been stated and a link to this original article is included. Should you need more information about Jobfeed or further clarification with regards to the figures provided here, do not hesitate to contact us at info@textkernel.com.